You are competing with your jealous colleague for a promotion. It is likely that you will succeed as more colleagues support you. Your opponent understands that a stable, harmonious, and calm work environment is favorable to you and unfavorable for him. To defeat you, your colleague uses all kinds of dirty tricks to create chaos, turmoil and trouble for you. This kind of workplace politics is almost identical to Venezuelan politics. Juan Guaidó, the self-declared president, has been trying his best to destabilize the oil-rich South American country by organizing street protests against the government, attempting to bring in the so-called "humanitarian aid" from the United States, and inviting external forces to intervene in any way. Since Hugo Chávez came to power in 1999, Venezuela has been highly debated by international media. On the political front, Chávez carried out the so-called Bolivarian Revolution. This political process is named after Simón Bolívar, an early 19th-century Venezuelan and Latin American revolutionary leader. On the economic front, Chávez strengthened government regulations and implemented nationalization policies. On the social development front, he spent a tremendous amount of money on improving the well-being of the poor people. On the international stage, he strongly opposed the U.S. hegemony by standing alongside Cuba and other left-wing nations in Latin America. The reactions to these policies were mixed. The vulnerable people were happy as their living conditions improved, while the business sector opposed the government's programs that discouraged private investment. Moreover, U.S.-Venezuela relations became all the more antagonistic. This could explain why the U.S. was behind the scene of an unsuccessful military coup against Chávez in April 2002. After Chávez died in March 2013, Nicolás Maduro became the Venezuelan President. However, the new leader came to power at a bad time. The dramatic fall of the oil prices, from a peak of US$115 per barrel in June 2014 to under US$35 at the end of February 2016, worsened the economic situation thereafter. Economic development can only take place in a harmonious society with stable political conditions. However, Venezuela was suffering from political confrontations between the government and the U.S.-supported opposition. Since Guaidó declared he is the "legitimate" leader of Venezuela, the multiple crises in the political, economic, social and diplomatic fields of the country have become all the more unmanageable. 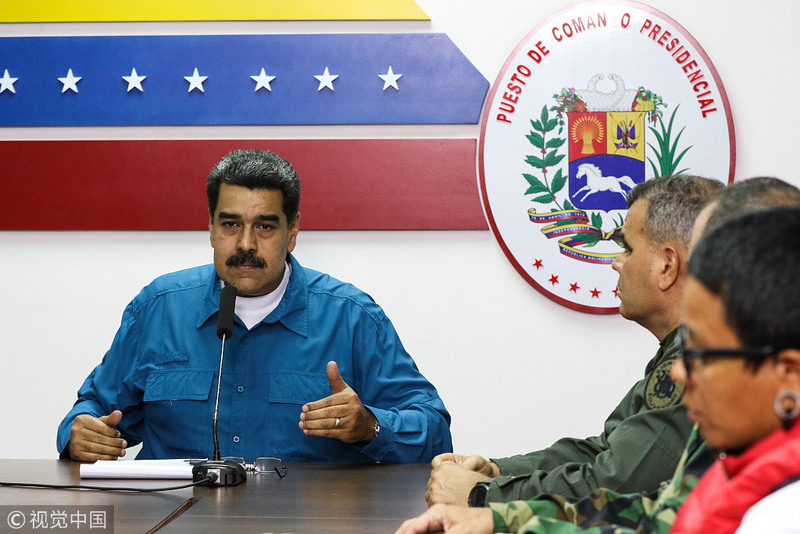 U.S. President Trump, Vice President Pence, and other senior officials have said that in order to deal with the situation in Venezuela "all options are on the table," meaning that the U.S. might use military means to overthrow President Maduro. Apart from verbal criticisms, the U.S. has tightened its economic sanctions against Venezuela, leading to more hardships for the Venezuelan government. Repeated blackouts in recent days have weakened President Maduro's hold on office. Maduro accuses the U.S. and the opposition of plotting these sabotages. No matter whether this accusation is supported by proofs or not, Guaidó and his supporters are glad to see that similar incidents will take place from time to time because chaos and turmoil can weaken the legitimacy of President Maduro. Which incident will be the last straw that broke the camel's back is anyone's guess. 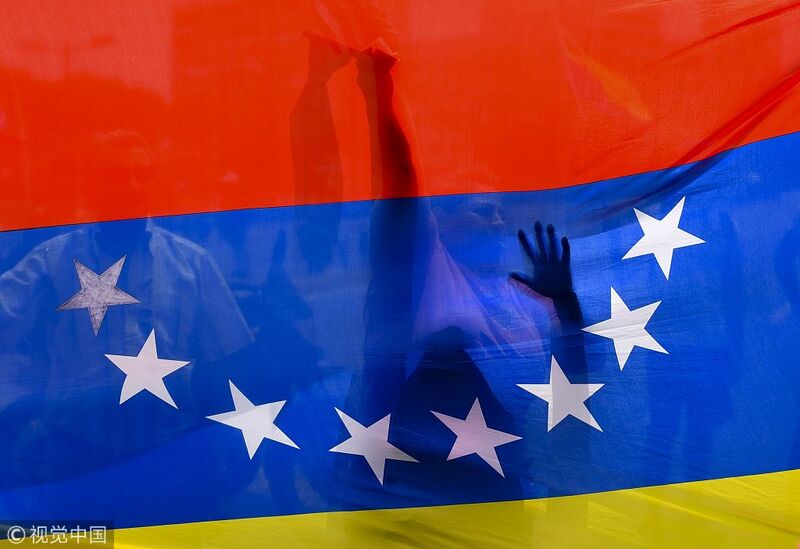 China has been criticized for its economic ties with Venezuela. Such criticism is groundless. As sovereign nations, China can develop economic relations with any country in the world, and the same is true for Venezuela. Moreover, both the Chinese investment in Venezuela and the oil-loan swap between the two sides are beneficial to the economic and social development of the South American nation. As a matter of fact, China's economic relations with Venezuela developed years before Chávez came to power. This kind of cooperation is based on mutual benefits and a win-win principle. What do the Venezuelan people need? Do they need Chinese investment and loans or American economic sanctions? The answer is crystal clear! China's policy towards Venezuela is clear and straight-forward: The future is in the hands of the people, and international laws, as well as the Venezuelan constitution, must be respected. Guaidó must understand that confrontations between the opposition and the government will harm both sides and the people. Political dialogues and compromise is the only way out of this terrible situation now. It is reported that President Maduro has agreed to talk to Guaidó and President Trump for a solution to the dangerous situation in Venezuela. However, the benign offer has fallen on deaf ears. The writer is a columnist with China.org.cn. The government and the opposition must work together to improve the conditions in Venezuela.